The Central Bank of Nigeria (CBN) has released guidelines for the recently signed bilateral currency swap between the country and China. 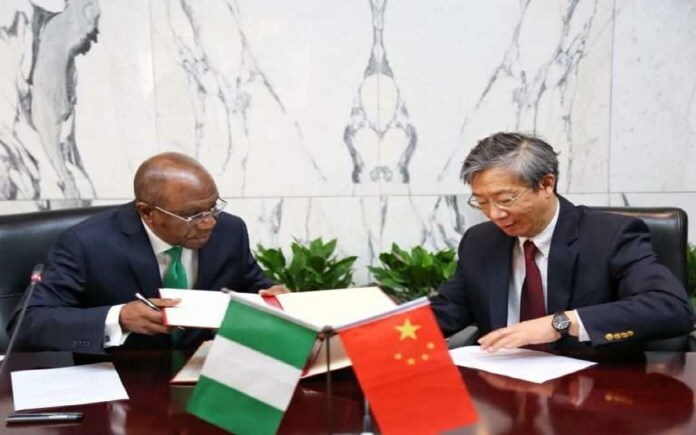 The new swap agreement will see both banks to among other purposes, make available liquidity in their respective currencies for the facilitation and promotion of trade and investment across the two countries through the purchase, sale and subsequent repurchase and resale of Chinese Yuan against the Naira and vice versa in which the apex bank may organize a bi-weekly bidding. Authorised dealers (Deposit Money Banks and Merchant Banks) shall open a Renminbi account with a correspondent bank and advise the CBN with Renminbi account details which may either be a bank onshore or offshore. Importers intending to import from China shall obtain a proforma invoice denominated in Renminbi as part of the documents for the registration of form M.
Forex purchased in the window shall not be used for payments on a transaction in which the beneficiaries are not in China. Also authorised dealers shall not open domiciliary accounts, denominated in Renminbi for customers. Letters of Credit transaction: All negotiating documents and shipping documents must be routed from the Beneficiary/Supplier bank to the issuing bank. Bills for collection transaction: Documents must be routed to the issuing bank either directly from the supplier’s bank or through the offshore correspondent of the issuing bank. Exchange rates “may be” determined via a “bi-weekly Renminbi bidding sessions” conducted by the CBN. Bids shall be settled spot through a multi-price book bidding process and will cut off at a marginal rate. Once you win a bid for the Renminbi, the CBN debits your account that day and you are given 72 hours to use it or else you will refund to CBN at the rate of purchase. The Renminbi will only be for “trade backed” transactions. Meaning you will need to have an actual trade before you can bid. The CBN will conduct a bi-weekly Renminbi bidding session and sales are applicable to only trade backed transactions. Authorised dealers are required to utilize the funds within 72 hours from the value date. The CBN will debit authorised dealers current account on the day of intervention with the Naira equivalent of the Renminbi bid request. Bids shall be settled through a multiple price book bidding process and will cut off at a marginal rate. Nigerian businessmen importing goods from China can now get direct access to Yuan rather than converting to dollars. Data from the Nigerian Bureau of Statistics (NBS) Foreign Trade Report for Q1 2018 shows China is the country’s largest import partner accounting for 21.09% valued at N530 billion for all imports.